The Hinkley Monaco designer 6 light satin nickel finish Art Deco style chandelier features C-shaped arms, metal-trimmed etched opal glass shades and hanging crystal ball decoration. A contemporary design, ideal for rooms with a low ceiling. Suspended from a smooth slightly domed circular ceiling rose, the central rod system is supplied in three heights to give you the choice of which height would suit your ceiling. The feauture glass shades sit within the semi-circle, with crystal spheres delicately suspended above. The design now starts to take the role of Art deco with a substantial stepped bullet shape centre where the six half circle arms cup outwards. A superb 1930’s style Art Deco inspired six light chandelier, with unusual half circle arms and compact opal etched glass shades rimmed in brushed nickel. Supplied with one 10cm, one 15cm and two 30cm rods that can be used separately or screwed together in any combination. Minimum height 47cm, maximum drop 132cm. Finding inspiration for Art Deco period lighting can be a daunting task. The Monaco lighting suite holds influential 1930’s style and would look perfect in the dining or living area. Designed in the USA by Hinkley Lighting, founded in 1922 in Cleveland, Ohio. 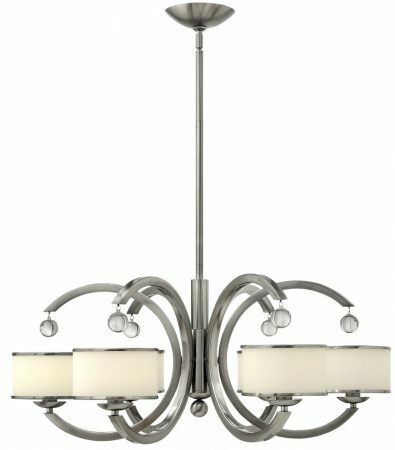 Their long heritage combines with a pursuit of innovative design to create modern and contemporary lighting such as the Monaco designer 6 light satin nickel finish Art Deco style chandelier features here. Hello Don, the light bulbs on the complete Monaco range cannot be seen and are completely contained within the shade.